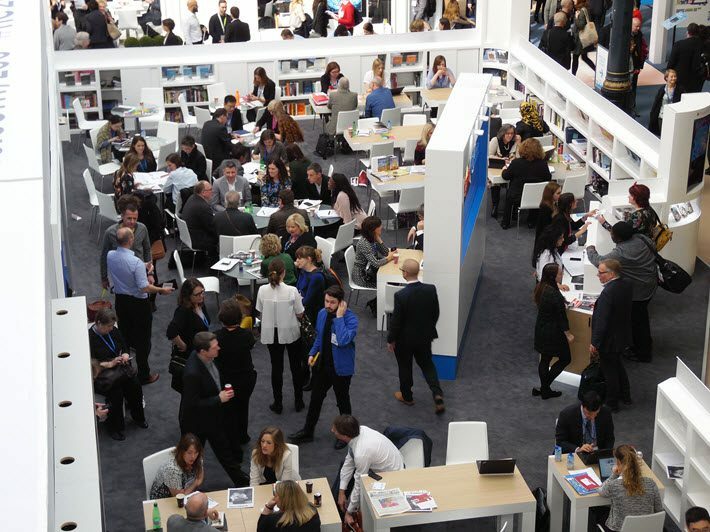 With publicity agents churning out releases and publishers’ stands hectic with meetings, London Book Fair has opened its crowded three-day schedule. 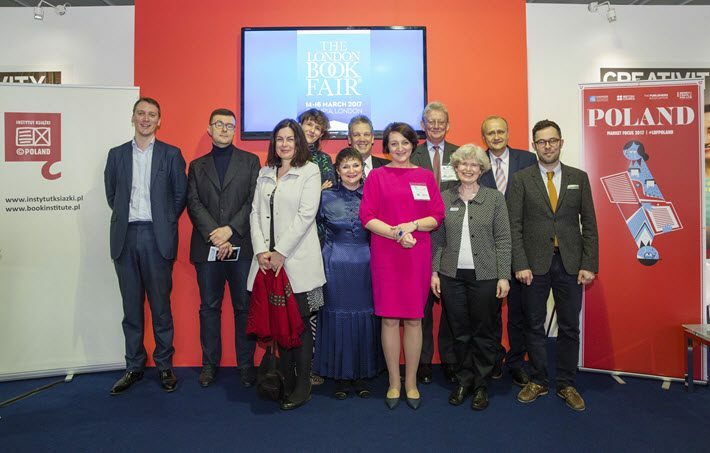 The opening news conference for the London Book Fair on Tuesday (March 14) was a rushed affair, not least because the blue-ribbon jury for the Wellcome Book Prize was scheduled shortly after it at the fair’s English PEN Salon. In fact, the fair seems this year almost to swing from one awards moment to another, as one prize program after the next adds its longlist, shortlist, or winners to the press-release bonfire that a trade show like this becomes. No sooner would the Wellcome jury chaired by bestselling author Val McDermid make a well-explicated reveal of its shortlist on Tuesday than embargoed news arrived of an incoming longlist from the Man Booker Prize, and the day would end with London Book Fair’s own smoothly produced International Excellence Awards. 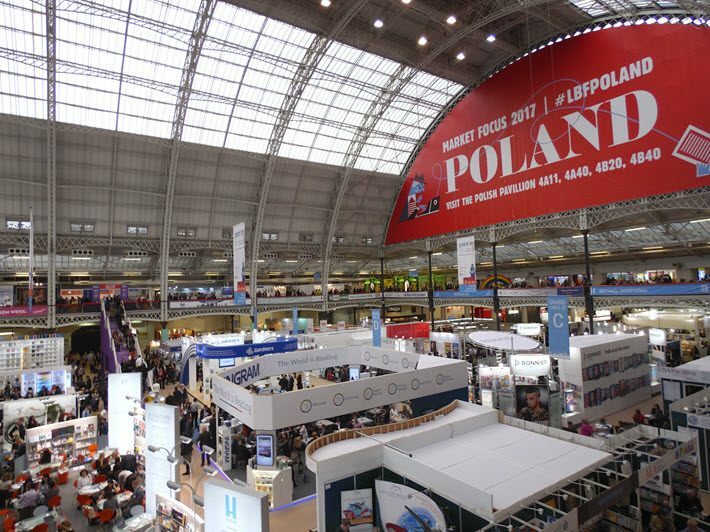 The big Polish pavilion, here for its Market Focus emphasis, has bins of apples and small fir trees, nice touches of a natural environment that’s otherwise almost nowhere to be seen in the show halls of publishing trade shows. A fine cohort of authors from Poland are on-hand and a series of events is underway, with its own guidebook and roving young people in bright red sashes helping to guide fairgoers to those events wherever they’re scheduled. 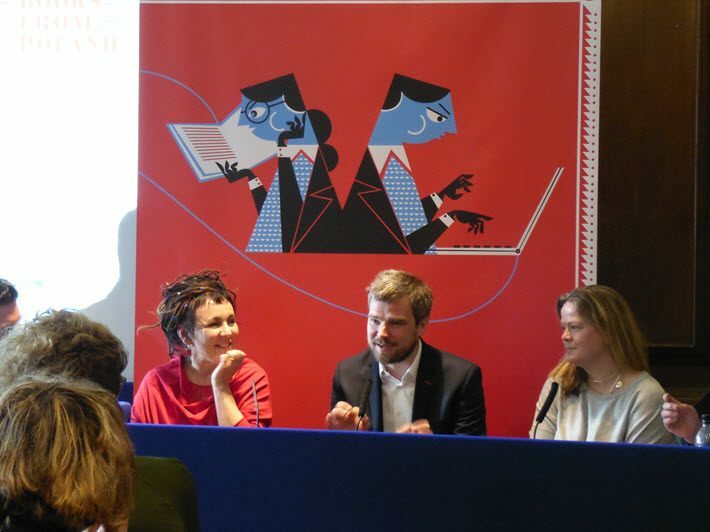 One of the early sessions in the Polish sequence featured authors Olga Tokarczuk and Zygmunt Miłoszewski on the socially serious nature of much crime writing in Poland, and its literary bent in style and tradition. 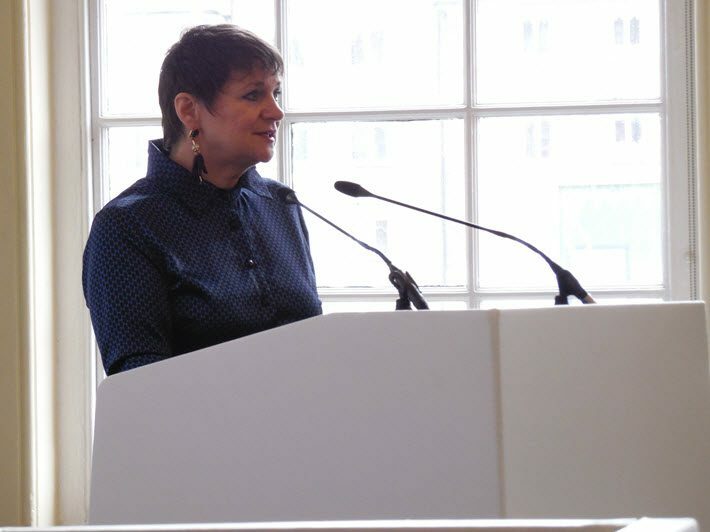 As she greeted the international media corps at the top of the day, however, the show’s director, Jacks Thomas, had helpful figures ready for context as to the scope of the fair this year. Fair-provided statistics indicate that 25,000 visitors again are expected this year, from some 130 countries. There are roughly 1,500 exhibitors, Thomas said, from more than 60 countries. As many as 42 percent of visitors to the fair this year are from overseas markets. Certainly, as rights play a greater role in publishing’s economic development, film and television seem to be on the minds of many, with a lot of key questions coming from an overflow audience at the Author HQ pavilion in the early afternoon on Tuesday about what types of work filmmakers and television producers are looking for. The anniversaries of the deaths of Joseph Conrad (160 years), Jonathan Swift (350 years), and Jane Austen (200). They’re more eagerly reporting some of the figures that the new UK Books & Consumers study from Nielsen have provided, as were highlighted in the pre-fair Quantum Conference. 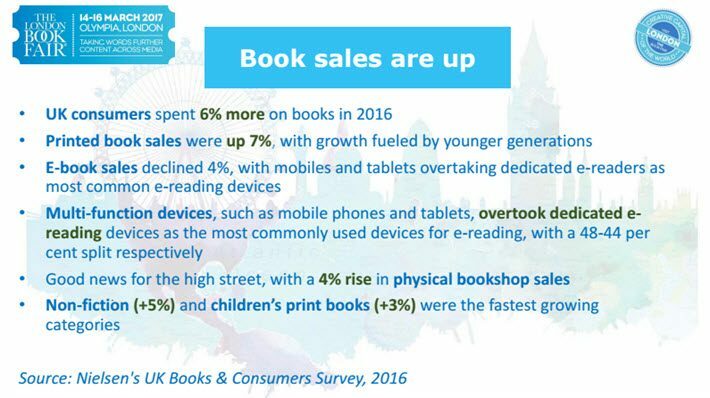 Thomas’ opening remarks included Nielsen’s cheering news of a 6-percent rise in book-buying in 2016 and a 4-percent tick up in physical bookshop sales. Much is being this year made of Nielsen’s detection in the UK of a trend toward youthful consumption of print, with strong showings from both male and female readers. 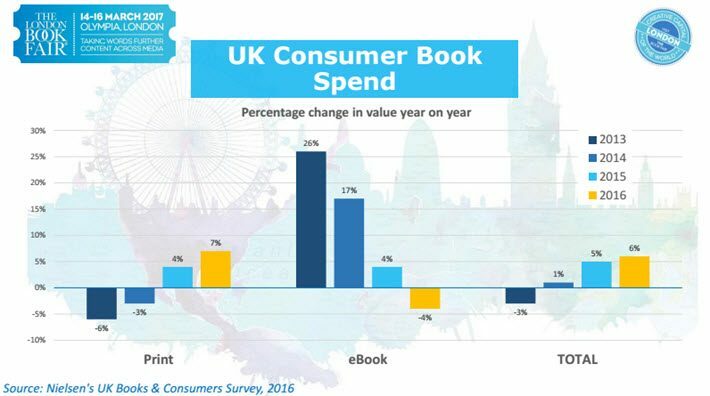 The spirits of print boosters are particularly lifted by the UK book spend’s reported bounce in print with ebook sales being described as all but underwater. It’s worth remembering that actual total sales of ebooks are not knowable to traditional survey techniques because the major online retailers that sell ebooks don’t report their sales figures, of course. Of particular interest in these intensely political times, the politics and government category, Thomas revealed, has grown 28 percent year-over-year in the UK, with political autobiography up 68 percent. Members of the news media would leave the opening press conference rushing along with officials to myriad events “double-parked” on the opening day’s calendar when, each year, far too many companies try to hold their newsy events at the same time. 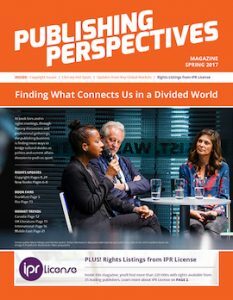 As press releases continued to choke journalists’ inboxes and the roar from the International rights Center flooded the elevator each time the doors opened, it seemed that the show was off to a very fast start for many. The crowd size looks healthy, long lines at concessions counters, passageways crowded, tables on publishers’ stands very active.